When you look up into the night sky, you see lots of stars—but all of them are members of our own Milky Way galaxy. With the help of some spacetime-warping science, though, our eyes can now peer much deeper into distant space. 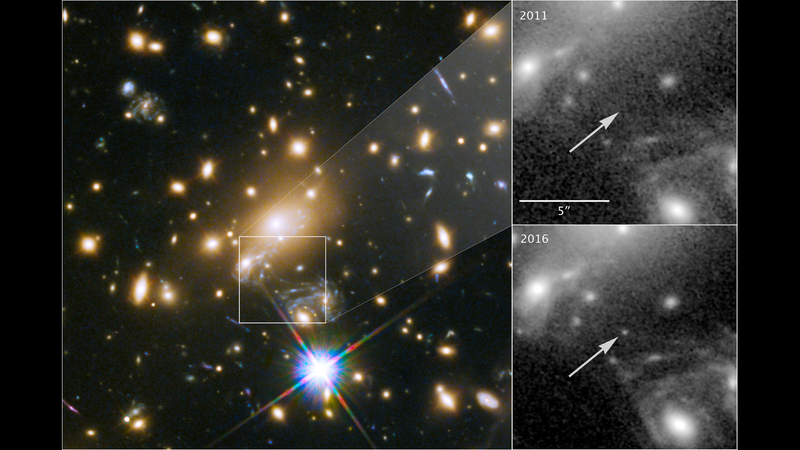 Two teams of scientists report seeing single, twinkling stars in galaxies billions of light years away with the help of the Hubble Space Telescope. All they needed was Albert Einstein’s theory of general relativity. A magnifying glass is just a tool that makes something appear bigger by changing the path taken by the light it emits or reflects. But who said a magnifying glass had to be made from glass? Massive clusters of galaxies can also bend the path of light, thanks to their gravity, so other galaxies located in just the right spot behind those clusters look much bigger to us. One team of researchers spotted a stellar explosion (but not quite a supernova) whose light had travelled 13 billion light-years and was magnified by a cluster of galaxies. Another saw a galaxy 14 billion light-years away magnifying another galaxy by a factor of 2,000—enough that they could see single stars in the galaxy’s light emission. Both teams reported their observations and analyses today in Nature Astronomy. This is very exciting, although these aren’t the most distant supernovae or stars ever confirmed. Scientists have spotted more distant supernovae, and you can say that recent observations of an eerie FM radio signal was evidence of the earliest (i.e. most distant) stars ever. But these observations are still pretty nuts, demonstrating how gravity’s warping of space itself could lead to some in-depth observations of ancient space. It’s unclear exactly what both of the events were—the first group observed two of what they call the “Spock” events. But it’s possible they were actually looking at two images of the same object, but the light was bent differently by smaller effects from the stars in the foreground lensing galaxies. Harvard astrophysicist Rosanne Di Stefano wrote in a Nature commentary that the lensing by the subcomponents of the foreground galaxy could help us better understand dark matter. That’s because dark matter has mass, and thus could warp the shape of space itself. The James Webb Space Telescope and the Large Synoptic Survey Telescope (LSST) could further study lensed events when they begin observing in 2020 and 2022, respectively. Anyway, space is so dope, and it’s nuts that we can just like, use the fact that heavy things literally warp the shape of spacetime itself in order to see stars clear across the universe.